Nature Nerds Unite! At Walking Mountains Science Center, ‘Nature Nerd’ is a term of endearment. This honor is only given to their most respected staff who are ready to awaken a sense of wonder in locals and visitors alike about this beautiful place we call home. 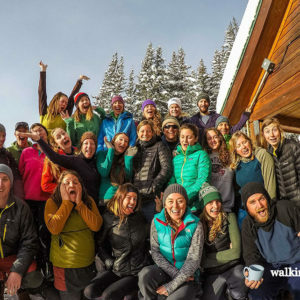 It’s exactly this type of fun-loving attitude mixed with a passion for their mission that helped Walking Mountains earn the Vail Valley Partnership’s 2015 Best Place to Work at their 13th Annual Success Awards on Friday, May 13th. The local community nominates organizations and the winners are chosen by a committee made up of last year’s winners. It was just a year ago that Walking Mountains was awarded Nonprofit of the Year at the same event. “We were honored to receive the 2014 Nonprofit of the Year, and one can imagine our excitement when we learned we were nominated for Best Place to Work in 2015. As our organization grows, we are always focusing on fostering a positive staff culture because we believe what makes us unique is our talented staff,” said Markian Feduschak, President, Walking Mountains Science Center. This kind of positive enthusiasm and gratitude pervades the staff culture at Walking Mountains. It would not be a stretch to say that all of their employees feel a sense of belonging to something greater, that they are making a positive difference in the world, and inspiring the lives of the youth and adults that participate in Walking Mountains’ educational programs. It is this overall outlook of their employees that truly inspired a Walking Mountains’ board member while he and his wife attended a program led by their staff at the Vail Nature Center last summer. Due to their positive experience, and recognition of the passion and care that each Walking Mountains employee takes in educating the community, they made a transformational unsolicited $1 million gift to create a Professional Development Endowment dedicated to the training and development of all staff—from interns, to educators and administrators. The gift will provide $50,000 annually for professional development which will triple the current amount available to staff.